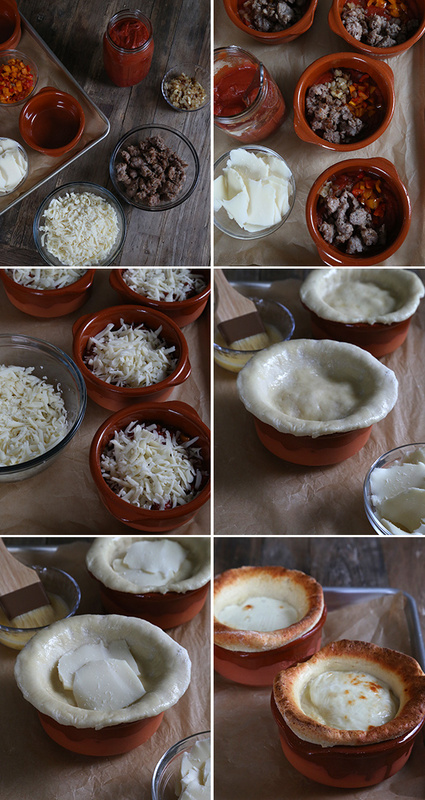 Gluten Free Pizza Pot Pies | Great gluten free recipes for every occasion. I’ve given myself the informal deadline of proving to you by the end of the calendar year that the gluten free pizza dough from GFOAS Bakes Bread is the sort of thing that you simply must keep in your refrigerator every.single.week. In service of that goal, I give you these gluten free pizza pot pies. They don’t taste like more traditional pot pies, but they’re made up of all sorts of savory goodness packed into 2-cup ramekins (sauce! cheese! sweet peppers! sausage! )—all covered in my most favorite gluten free pizza dough. I can attest to the fact that one ramekin + a green salad = dinner even for a whole bunch of freakishly hungry growing children who never ever eat off of a children’s menu and sometimes even find an adult-sized portion to be, well, lacking. The fillings can be made ahead of time and stored in the refrigerator (separately or all mixed together), then topped with pizza dough (and more cheese!) and baked to perfection. The whole thing comes together rather quickly. And if you’re faced with a family that sometimes has to eat in shifts (hey, it happens), you can assemble all the individual dishes, and bake them as you need them. Preheat your oven to 400°F. Divide the tomato sauce equally among 6 individual oven-safe ramekins, each about 16 ounces in capacity. Line a rimmed baking sheet with parchment paper, place the ramekins on top and set aside. Place a medium, heavy-bottom saucepan over medium-high heat and add the sausage. Using a wooden spoon, break up the pieces until they’re bite sized. Cook, stirring occasionally, until the meat is cook through (about 8 minutes). Remove the cooked sausage from the pan to a small heat-safe bowl and set it aside. You may now either drain all of the rendered fat from the sausage and add 2 tablespoons olive oil to the pan, or drain some of it and use 1 tablespoon olive oil. I usually do the former. Add the onion and diced pepper, and cook, stirring frequently, until the onions are translucent and the pepper is softened (about 8 minutes). Add the garlic and cook, stirring frequently, for another 3 minutes or until the garlic is fragrant. Divide the vegetable mixture and the cooked sausage among the ramekins, and mix to combine. 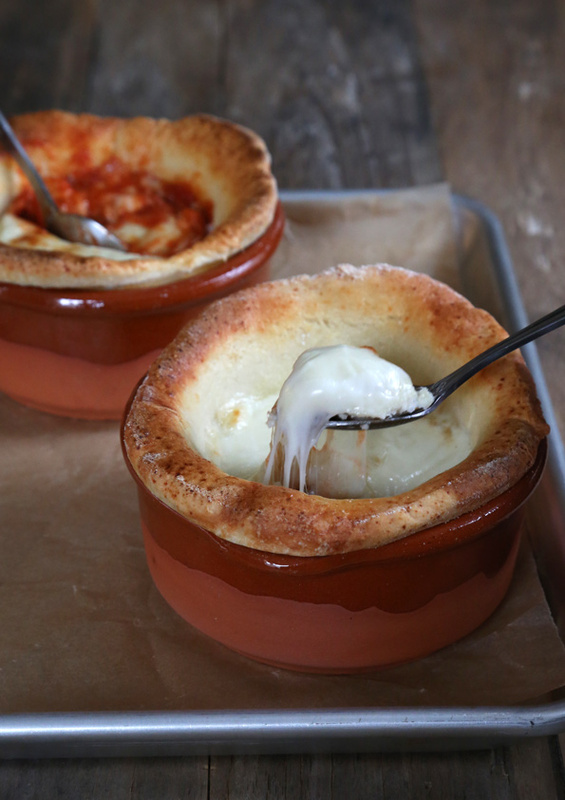 Divide the shredded mozzarella cheese among the ramekins, and set them aside. Divide the prepared, chilled pizza dough into 6 equal pieces. Place each on a lightly floured surface and, using a rolling pin and the method seen in this (oddly quiet) video, roll the dough into a round of dough at least 1/4-inch thick. Transfer each piece of dough to its own ramekin, placing it on top, with the edges overlapping the top of the baking dish. Lightly press the dough down on the top of the shredded cheese. Using a pastry brush, cover the pizza dough generously with the egg wash and top with a couple slices of sliced mozzarella cheese. 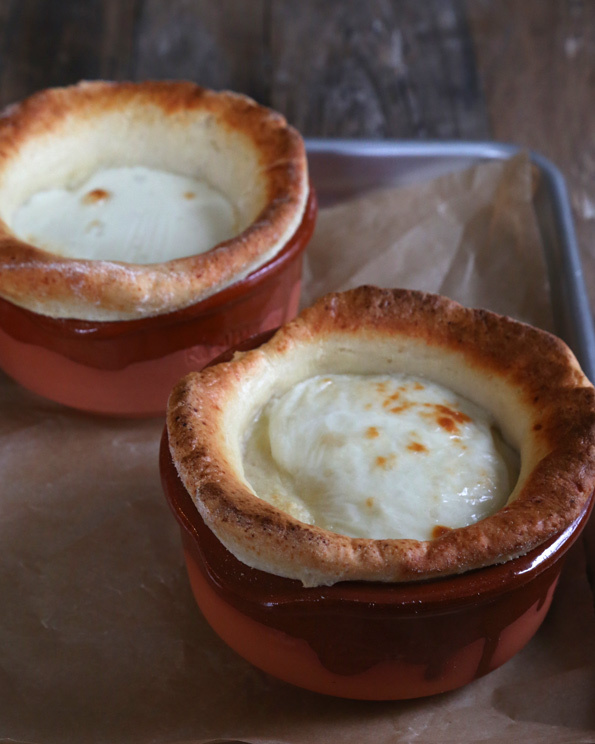 Place the ramekins, still on the baking sheet, in the center of the preheated oven and bake until the pizza dough is golden brown all over and the cheese on top has begun to brown (about 15 minutes). Remove from the oven and allow to cool briefly before serving. Adapted from Pillsbury, as selected from my Must Make Gluten Free Pinterest Board. P.S. If you haven’t yet, I hope you’ll consider picking up a copy of Gluten Free on a Shoestring Bakes Bread. Your support keeps the blog going and the books coming! These look delicious, however my GF mom was positively craving sausage rolls the other day, and I was wondering if you would please post a recipe for them, if you have one. Thank you! Super yum! Love your pizza dough! I have reheated them, Lucy, and they do great. There’s so much moisture underneath so they stay quite well. On strike? That’s awful, hope all is sorted soon! My children all went off to school this morning, can you see me dancing? This will go in the mix for us, sometimes making actual pizza is so much effort, you know? These look easy-peasy and delicious. I’m so jealous, Anneke. So, so jealous. But all the same, I’m happy for you. You certainly earned it, especially with your antics of letting the kids take turns with the shopping, menu planning, etc. this summer!